Homepage. This page: Preserved 33 Pickup seen at an event in Shropshire. Now for a really unusually little commercial - the pickup version of the 33 Variomatic DAF seen here in restored condition. All pickups from the 60s & 70s are getting rare and I'm sure I've not seen a DAF pickup before anywhere. DAF Books Whether for the 33 Pickup as shown below, or any other type of DAF, it is worth having a look on Amazon for books, DVDs, Videos etc. 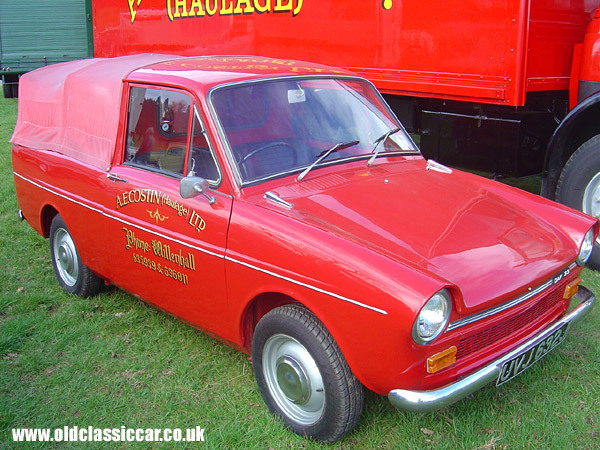 Have you seen today's eBay auction listings for the DAF 33 Pickup? Photographs of classic vehicles at Weston Park in Shropshire. I've featured 105 of the photos that I took at Weston Park, including this one of the DAF 33 Pickup that was at the show on the Sunday (its a 2 day event). There was an interesting selection of classics on display, many of which I've not seen before. More pictures from this particular show can be seen on the Weston Park page. Links to pics of other DAFs, if I have some, are further down this page. All the car & other vehicle photographs have copyright on them.